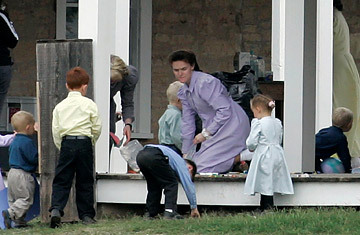 Adults and children, members of the Fundamentalist Church of Jesus Christ of Latter Day Saints, gather beneath a covered porch at their temporary housing in San Angelo, Texas. Texas social workers will begin conducting DNA tests today to identify the 416 children taken into custody from the fundamentalist Mormon ranch near Eldorado since April 3. A district court judge granted the Texas Department of Family and Protective Services (TDFPS) permission to test the children last Friday, as the agency's custody workers continued to struggle with the serious, complicated task of determining which children belong to whom  a task further clouded by the fact that children and mothers gave evasive, shifting answers during interviews. Genetic testing could be completed in as little as a few days, according to Howard Coleman, CEO of Genelex, a Seattle-based commercial genetics lab, which is not involved with the Texas case. It could take several weeks longer, however, to construct a family tree from the results. Once they are traced, however, the children's origins may offer a fascinating look at the family structure of the secretive polygamist sect, as well as insight into the emergence of a tragic birth defect that has plagued the community. At the heart of the identity problem are the group's commitment to "celestial marriage"  polygamy  and its custom of allowing first cousins to marry. "Your family tree shouldn't be a wreath," says Randy Mankin, editor of the El Dorado Success newspaper, which unearthed the sect's Utah roots four years ago, when its first members, posing as businessmen, arrived in Eldorado under the pretense of building a hunting and game preserve. But the legal notices published in Mankin's paper listing the custody suits brought by the state against the Fundamentalist Church of the Latter Day Saints of Jesus Christ (FLDS) illustrate just how circular relationships are. Four surnames dominate the list: Jeffs (relatives of Warren Jeffs, the sect's imprisoned leader and "prophet"), Jessop, Barlow and Steed. In the 1930s, two families, the Jessops and the Barlows, settled the area around Hildale, Utah, along the border with Arizona, where they founded the FDLS  and began handing down to their descendants a recessive gene for a severe form of mental retardation called Fumarase Deficiency. The birth defect has become increasingly prevalent within the FLDS community since 1990 when it was first identified by Dr. Theodore Tarby, an Arizona pediatric neurologist, now retired but formerly with the Children's Rehabilitative Services in Phoenix. He saw his first case when an FLDS mother brought her severely retarded son to see him. Tarby asked the mother whether any of her other children had problems, and she mentioned a daughter with cerebral palsy  testing proved that she, too, had Fumarase Deficiency syndrome. The birth defect  an enzyme deficiency  causes severe mental retardation, epilepsy and disfigurement of features. "The retardation is in the severe range  an IQ around 25," Dr. Tarby says. Afflicted children are missing portions of their brain, often cannot sit or stand, and suffer grand mal seizures and encephalitis. Language skills are nonexistent or minimal. "I remember one little girl has a fascination with coins and the only word she could say was 'money,'" the doctor said. Families whose children are affected often avail themselves of state-funded medical care, consistent with the FLDS philosophy of seeking government aid  despite their suspicion of government  which they call "bleeding the Beast." Until 1990 Tarby says he knew of only 13 cases of Fumarase Deficiency worldwide. Since, it has taken hold in the FLDS community because of intermarriage. "If you have two parents with the gene," Tarby says, "you are going to have a one-in-four chance of having a child afflicted with it." Depending on the severity of the disorder, children may die in childhood or may survive into early adulthood; if a person who has developed the disorder goes on to have a child, his or her chances of passing it on are one in two. But diagnosing the condition is difficult and requires extremely careful testing, the doctor says. His research, published in 2006, identified 20 cases within the Hildale-Colorado City enclave. "I would expect there are going to be Fumarase Deficiency cases there in Texas," he said. State officials will not release any medical information about the 416 children in their custody, but one mother, giving her name simply as Sally on CNN's Larry King Live, described her son as "handicapped" and needing hourly care. "One of the mothers raised concerns about her child who had Down Syndrome," TDFPS spokesman Greg Cunningham told TIME in an e-mail. "That child has had a medical evaluation and has had one-on-one care." Cunningham says that the children in custody at the Pavilion, part of the city's civic center complex, have one caregiver for every three children. A small number of older boys have been moved to the Cal Farley Boy's Ranch in Amarillo, a privately funded home for needy children. The FLDS community, by and large, rejects the idea that Fumarase Deficiency is caused by genes, according to Tarby. "They have their mythology about the condition. They think it's something in the water, or something in the air," he says. Before Tarby retired in 2007, FLDS leaders invited him to address the community about the disorder and how to prevent it. He told them that prevention would involve barring marriages between people with the recessive gene, or asking those couples to forgo children. He suggested that families discontinue having children once the disorder presents itself, or test for the gene during pregnancy and selectively abort pregnancies with the deficiency. All were approaches rejected by the FLDS. "It's not something they are willing to do," Tarby says.